Mohammadpour, M., Sadeghi, K., Foroughi, A., Amiri, S., Pouyanfard, S., Parvizifard, A., Khoramniya, S. (2018). The Unified Protocol for Transdiagnostic Treatment of Emotional Disorders: Treatment of Comorbid Psychopathology Accompanying a Generalized Anxiety Disorder. International Journal of Behavioral Sciences, 12(3), 125-131. Mohsen Mohammadpour; Kheirollah Sadeghi; Aliakbar Foroughi; Shahram Amiri; Sahar Pouyanfard; Aliakbar Parvizifard; Samad Khoramniya. "The Unified Protocol for Transdiagnostic Treatment of Emotional Disorders: Treatment of Comorbid Psychopathology Accompanying a Generalized Anxiety Disorder". 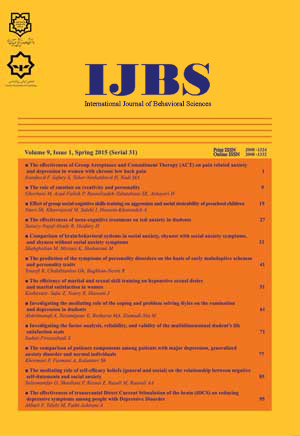 International Journal of Behavioral Sciences, 12, 3, 2018, 125-131. Mohammadpour, M., Sadeghi, K., Foroughi, A., Amiri, S., Pouyanfard, S., Parvizifard, A., Khoramniya, S. (2018). 'The Unified Protocol for Transdiagnostic Treatment of Emotional Disorders: Treatment of Comorbid Psychopathology Accompanying a Generalized Anxiety Disorder', International Journal of Behavioral Sciences, 12(3), pp. 125-131. Mohammadpour, M., Sadeghi, K., Foroughi, A., Amiri, S., Pouyanfard, S., Parvizifard, A., Khoramniya, S. The Unified Protocol for Transdiagnostic Treatment of Emotional Disorders: Treatment of Comorbid Psychopathology Accompanying a Generalized Anxiety Disorder. International Journal of Behavioral Sciences, 2018; 12(3): 125-131. Introduction: Comorbidity among the generalized anxiety disorder is common and may negatively impact treatment outcomes. This study aimed to examine whether the Unified Protocol (UP), a transdiagnostic cognitive-behavioral therapy for emotional disorders (i.e., anxiety, mood, and related disorders), is efficacious in the treatment of co-occurring disorders and symptoms Generalized Anxiety Disorder (GAD). Method: The research method is semi-empirical pretest-posttest and follow-up plan with a control group. In this randomized clinical trial, 24 GAD patients with comorbid disorders and symptoms of depression, social anxiety and health anxiety have been treated with pharmacotherapy treatment-as-usual or pharmacotherapy treatment-as-usual with 12 sessions of transdiagnostic therapy. Beck Depression Inventory (BDI-II), Social Anxiety Inventory (SIAS) and the Short Form of Health Anxiety (SHAI) were used for assessing comorbidities in pre-test, post-test and 2-month follow-up. Data analysis were done using the SPSS V20. Results: Significant differences were observed between the two groups. In the treatment group for pharmacotherapy treatment-as-usual and UP, GAD Patients, showed a significant decrease in the comorbid disorders and symptoms of depression, social anxiety and health anxiety compared to the pharmacotherapy treatment-as-usual. Conclusion: The findings of this study validated the effectiveness of the UP in decreasing comorbid disorders and symptoms of the generalized anxiety disorder. This protocol has a high clinical value in treating emotional disorders and other related disorders.